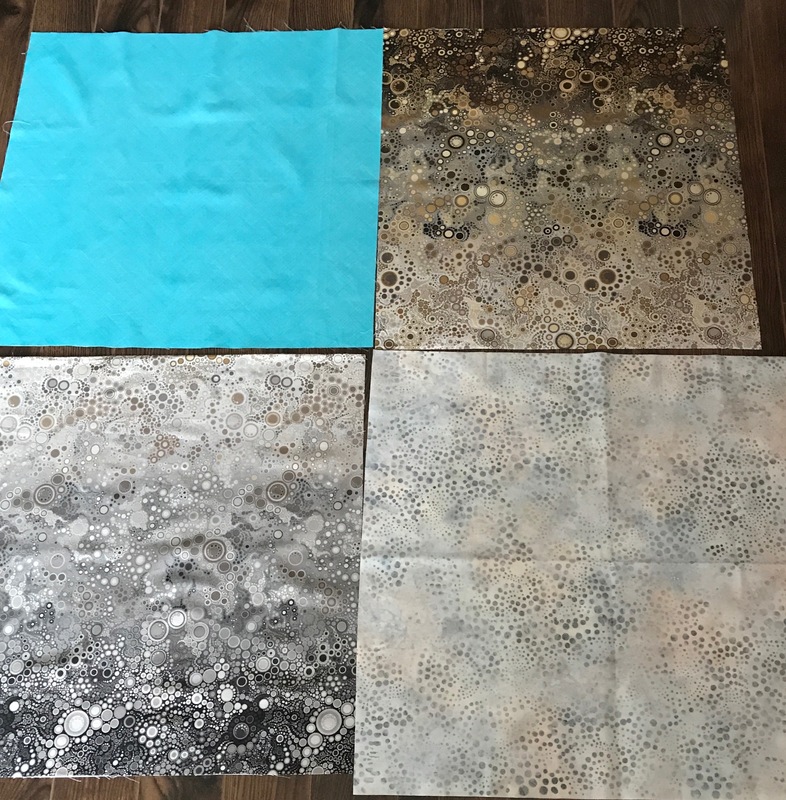 I’ve had this piece of ombre fabric sitting around for a while – I bought a metre at the time because I liked how the colours shaded from grey to brownish. I had nothing to go with it; I just put it away. 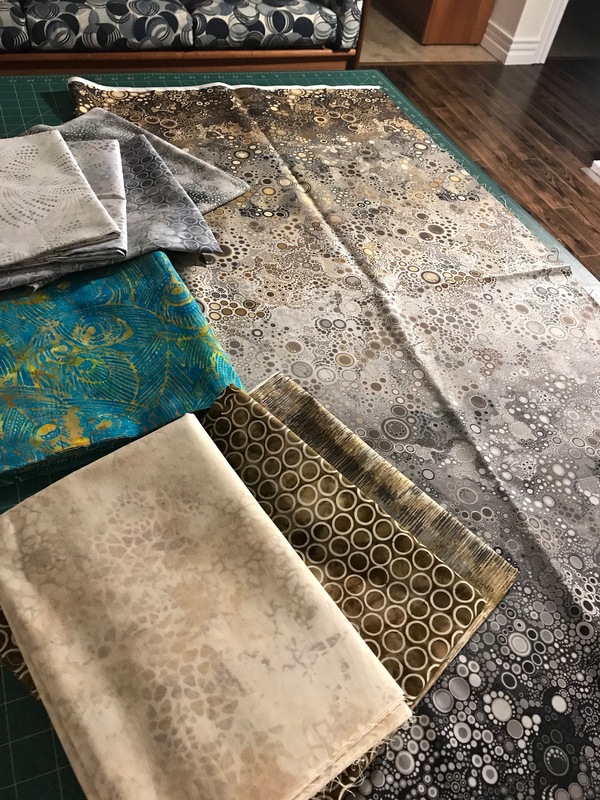 Today I was at Sew With Vision (my local Pfaff/Husqvarna dealer and fabric shop) to pick up a new foot for my Pfaff embroidery machine and there were two stacks of recently arrived fabric sitting on the edge of the cutting table. 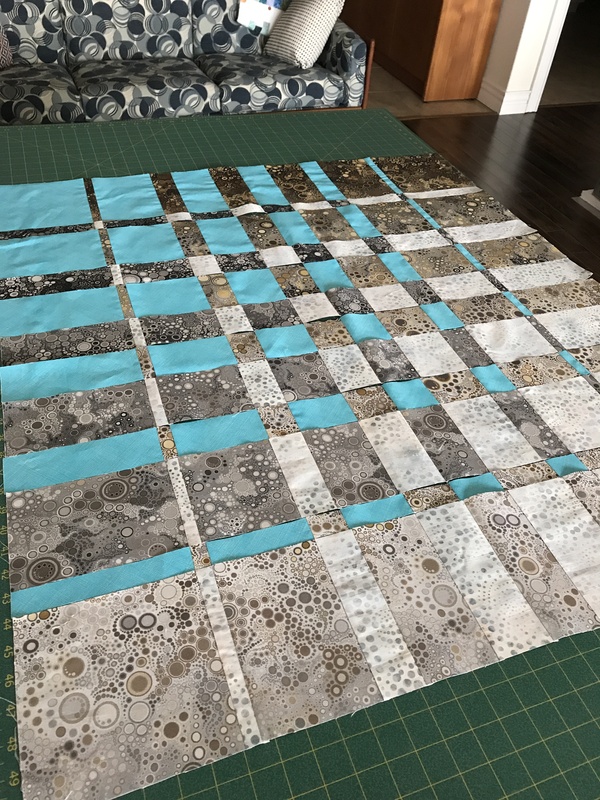 I wasn’t thinking about the ombre fabric but no sooner had Cathy cut me 1/2 m of three of them (grey circles, brown circles and grey/beige with metallic lines) that I remembered the ombre and realized they’d go together. I came home, and went through my stash and came up with some other fabrics I had on hand and pulled them out. Looks like “dots” were calling to me. The greys (sitting at the brown end of the ombre) need one more darker grey to pick up the darkest grey shades at the nearer end of the ombre. Probably could also use one more tan-ish fabric as well. AND I need some kind of contrast – I’m auditioning the turquoise/yellow batik but that may not be what I want. 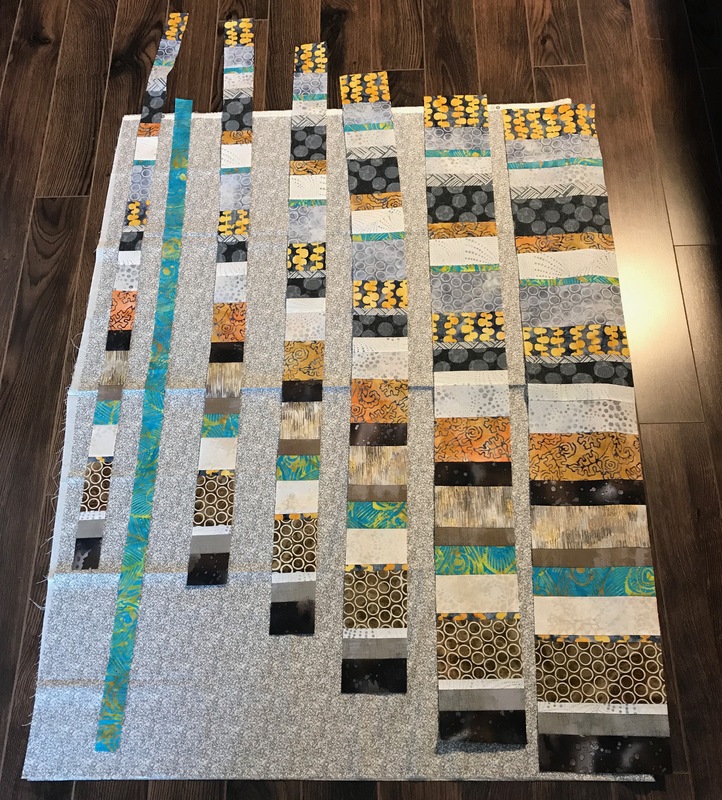 I may have to take the pile to Sew With Vision to see if there’s anything else there that works with the greys and browns and beiges that will bring those colours to life. And what might I do with them? Not a clue, yet! 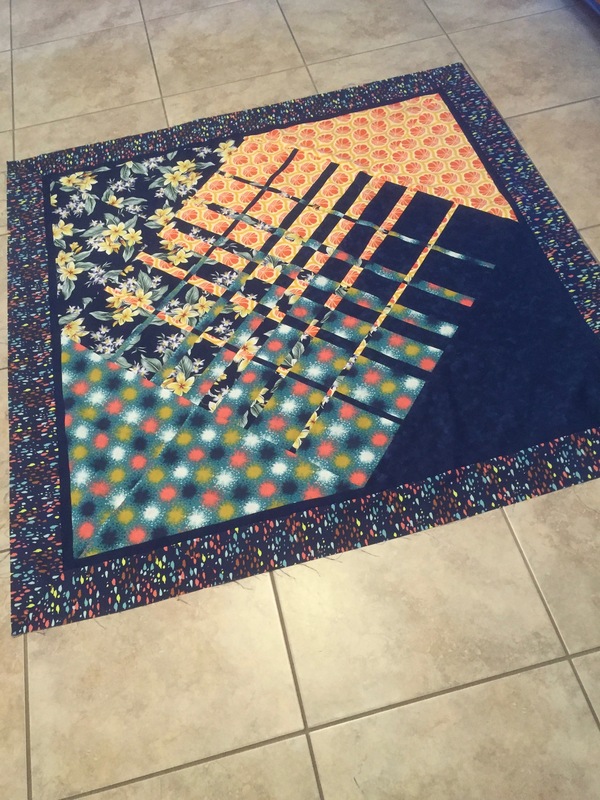 Here’s where I need to browse pictures of modern quilts to see if anything presents an idea. 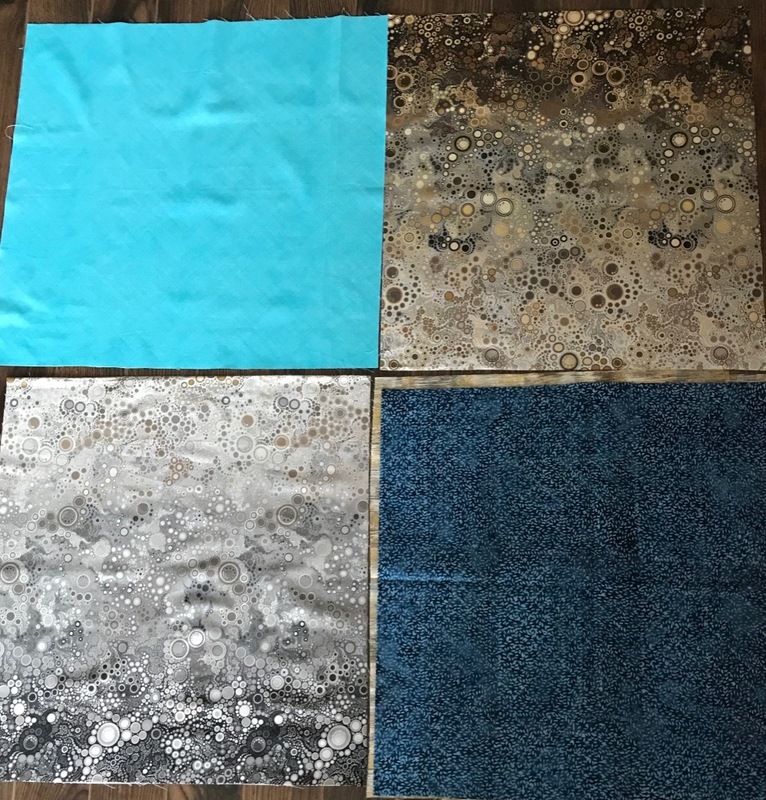 I always thought the ombre might be used in another convergence quilt, but this collection of fabrics doesn’t lend itself to that. 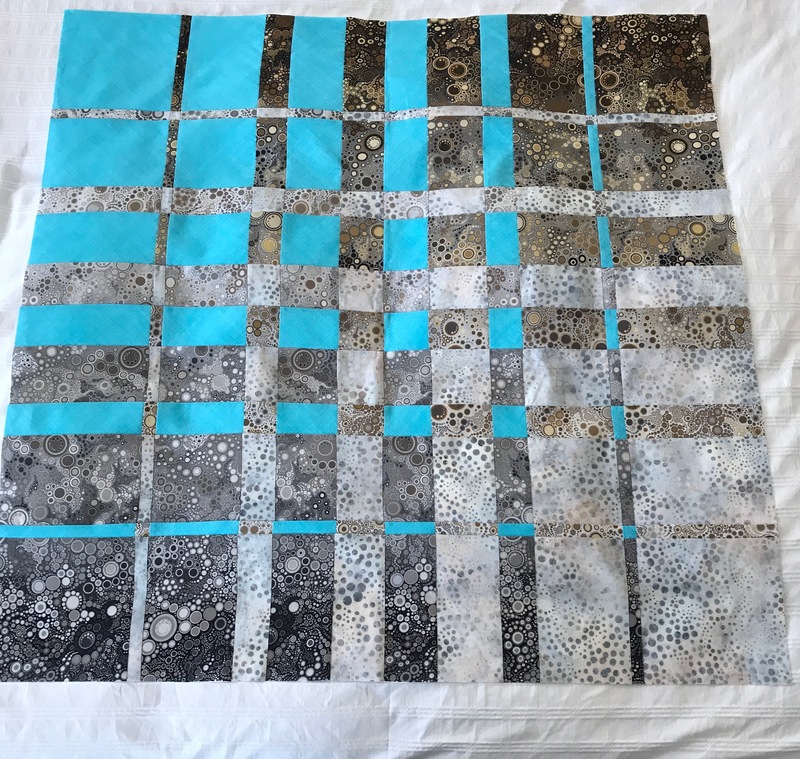 Nope, at this moment, I have no idea what shape this quilt will take. 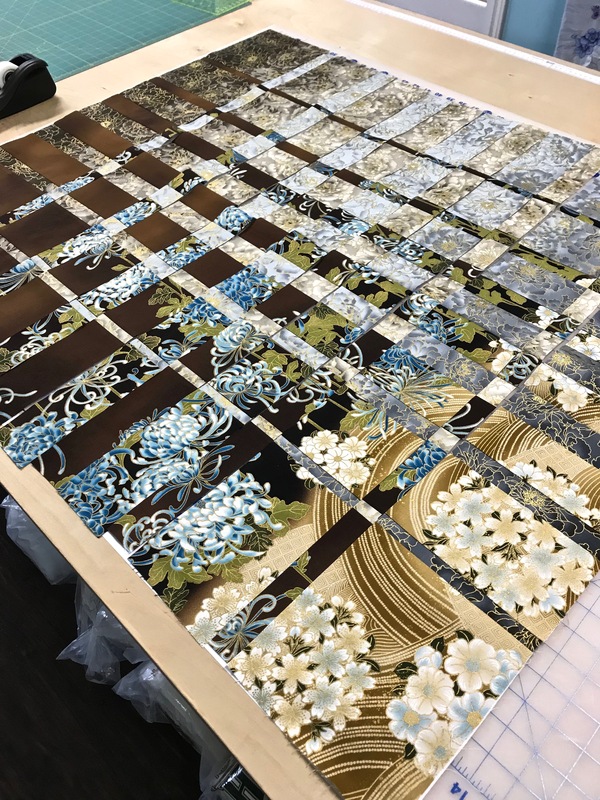 Just need to sleep on it, walk around the fabrics for several days – something will suggest itself…. 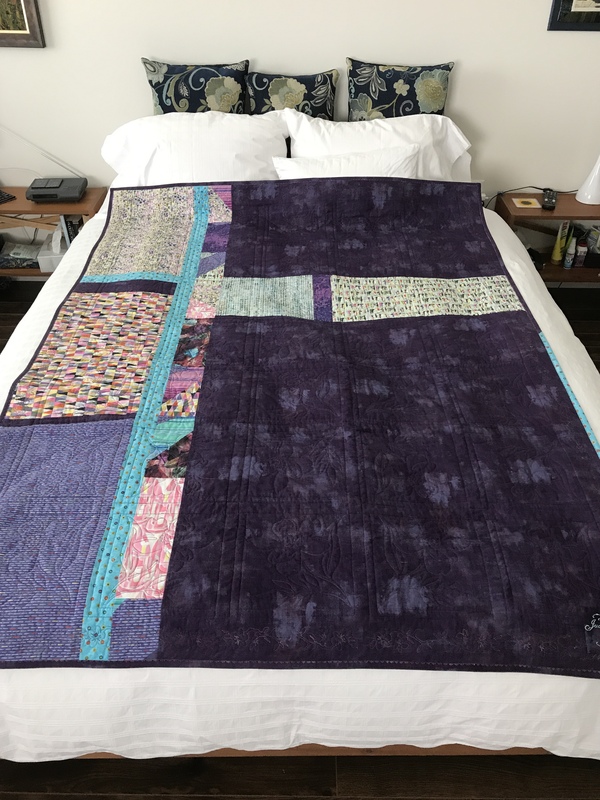 The quilt turned out a bit larger than I usually make – the addition of the drop shadow sashing added 2.5″ to the width and 3.5″ to the length and the outer border added another 6″ – finished size: 54″x 72″. 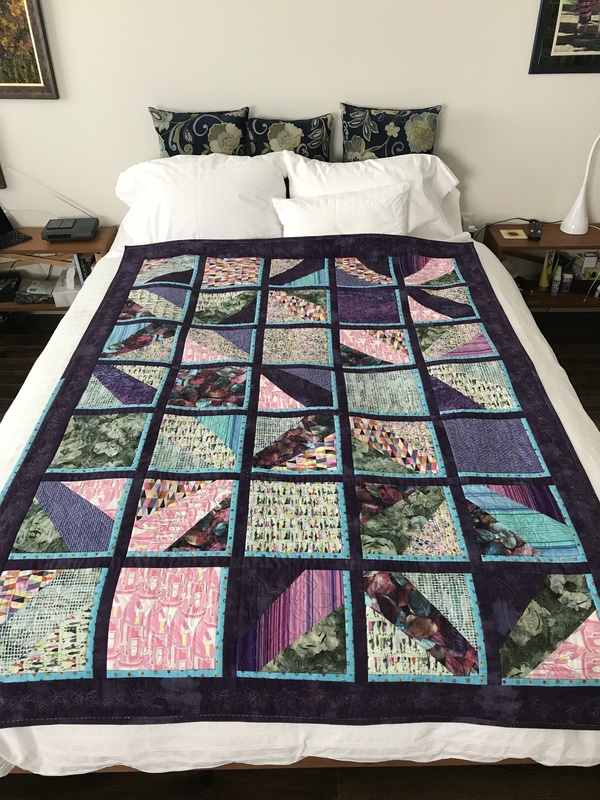 But the drop shadow sashing was needed to brighten the whole thing and make it less “pink” and the top needed the wide outer border to give the quilt definition. 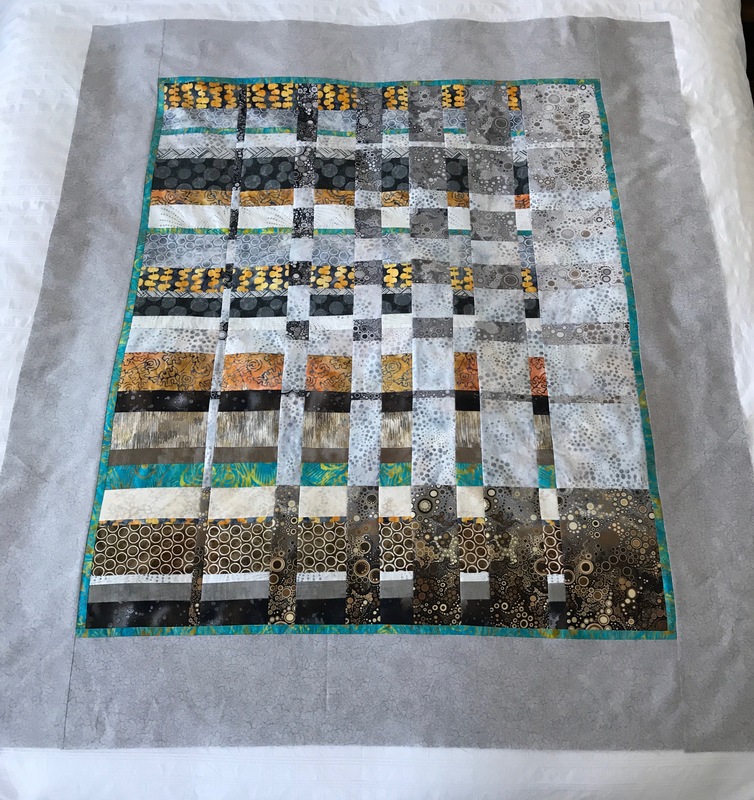 In the end I did quilt-in-the-ditch along the sashing and the drop shadow. I quilted with a block single run embroidery. The border was also quilted with a long, narrow embroidery which turned out well. I used a purple variegated Sulky 30wt cotton. (Can be annoying because if you don’t use a 90 top stitch needle the thread is prone to fraying and breaking. I used a 90 stop stitch needle and I still had some breaking.) However, the quilting went relatively smoothly overall. 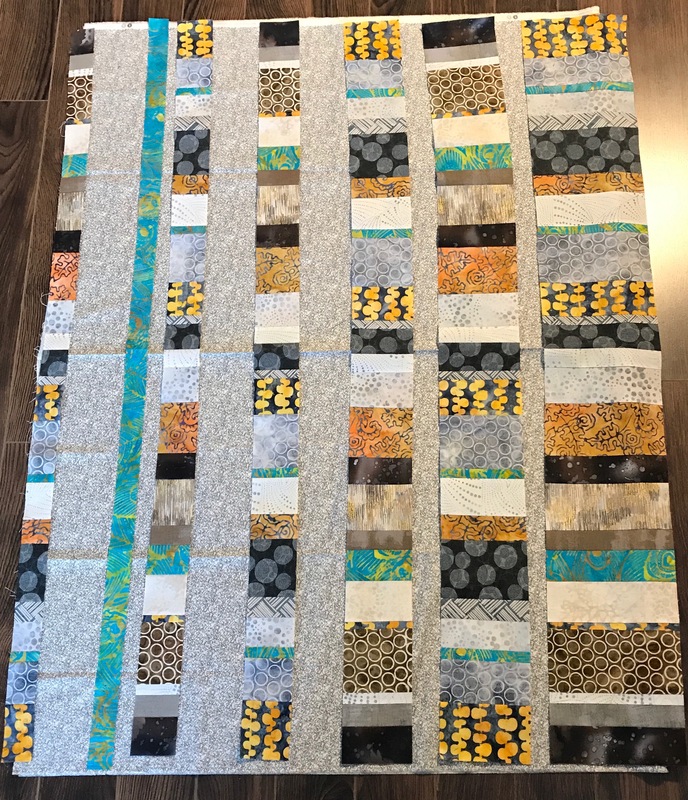 I’m pleased with how the quilt back turned out as well – the large pieces of fabric with narrow contrast elements plus the pieced strip worked out well and the horizontal stripe adds more interest. 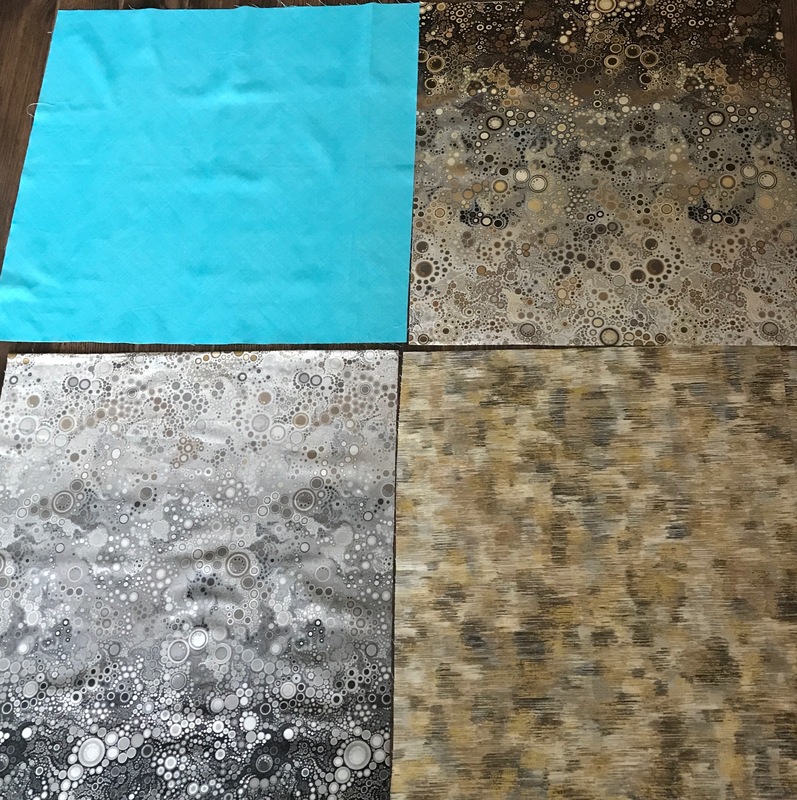 I must say, I like the Grunge (Moda) fabrics – the tonal quality of them adds lots of life to a fabric, very useful for quilt backing. You won’t notice it but I added a piece of the turquoise contrast fabric to the binding “just because”. 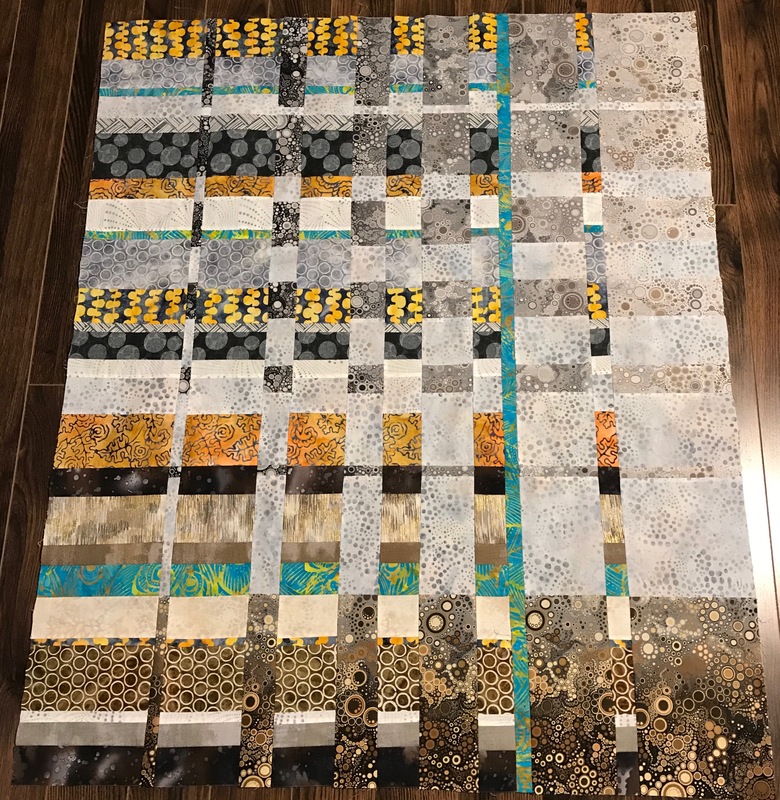 That’s quilt #5 since August – five quilts/four months – not bad. 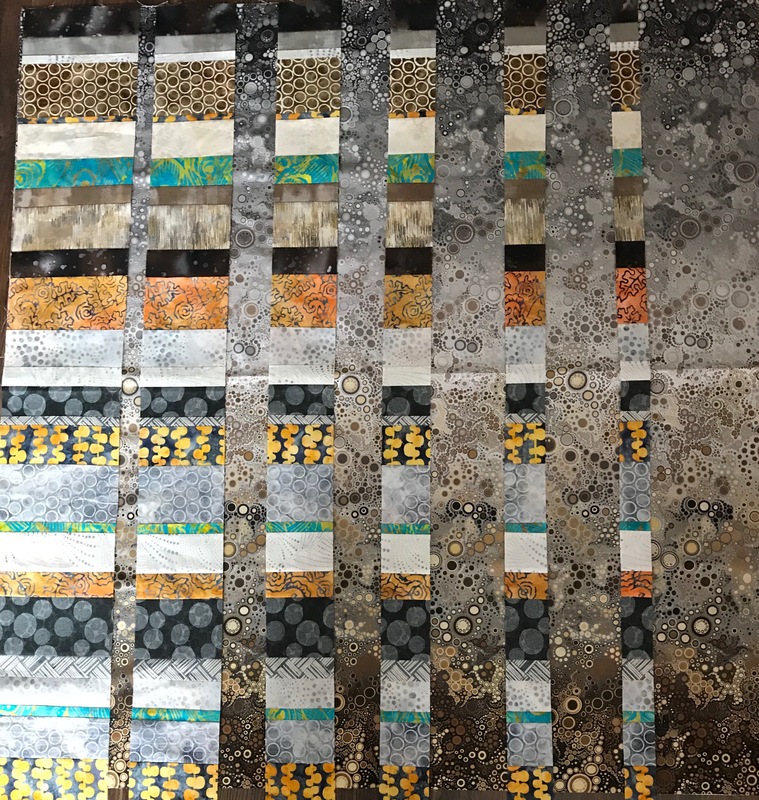 That’s it for quilts at the moment – now onto a Kantha jacket for a friend, then a couple of pairs of cords for me and a wall art piece based on a photo I took in Italy in April. No end of projects, just not enough time.